We’d love your help. Let us know what’s wrong with this preview of Wednesdays in the Tower by Jessica Day George. Strange things are afoot in Castle Glower: new rooms, corridors, and even stables keep arriving, even when they aren't needed. Celie's brother Bran, the new Royal Wizard, has his hands full cataloguing A castle that is constantly rearranging itself, and a young royal family sworn to protect it... Celie, Rolf, and their beloved Castle Glower are back in this exciting sequel. To ask other readers questions about Wednesdays in the Tower, please sign up. Just finished the Big Rewrite, November 24th, 2012! Read aloud to the kids, Summer 2014. The adventures of Princess Celie, who lives in a magical castle where rooms appear, shift around and disappear again, continue in Wednesdays in the Tower, Jessica Day George’s lively sequel to Tuesdays at the Castle. Normally Castle Glower only moves its rooms around on Tuesdays, but one Wednesday Celie, heading up the stairs to go to the schoolroom for lessons, finds herself in a passageway leading to a tower room she has never seen before. And in the middle of the tower room is a huge, flame-colored egg, as large and orange as a pumpkin. Mysteriously, the castle prevents Celie from sharing her exciting discovery with anyone else in her family: the tower room disappears when she tries to show it to others, and interrupts her attempts to tell about the egg. Why is the castle hiding the egg from everyone except Celie? When the egg hatches, Celie has her hands full, feeding and mothering a ravenous baby griffin ― an animal that everyone in the kingdom thinks is only a myth. As the griffin grows older and much larger, Castle Glower gradually allows Celie to share her new friend with a few others. But the castle is behaving very oddly in other ways as well: new rooms appear that the royal family has never seen before, doors get blocked off for reasons known only to the castle, and the entire castle is getting much larger and more dangerous. Could this have anything to do with the appearance of the griffin egg? 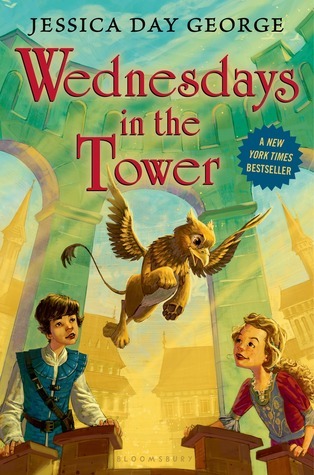 Wednesdays in the Tower is a good, solid follow-up to Tuesdays at the Castle, almost certain to please young readers who enjoyed the first book, and likely their parents as well. Celie is an empathetic, adventurous girl with a charming personality. The scenes with Celie caring for the baby griffin, and later learning to ride on its back as it flies around, are a lot of fun, particularly for readers who like animal stories. Some parents might be a little perturbed at the idea of a twelve-year-old daughter keeping a huge secret from her parents (“The castle didn’t let me tell anyone!” may or may not be viewed as a sufficient excuse), but I suspect young readers will greet the idea with glee. The mystery of the castle’s odd behavior is not as compelling as the griffin plotline, and might be a little complicated for the youngest readers (or listeners), but it fits in well with the overall plot. An antagonistic wizard arrives to try to resolve the problem, pursuing his own unknown agenda. Celie and her siblings don’t trust him, but it’s not clear whether he’s actually a villain, which adds some interest to that part of the plot. Wednesdays in the Tower ends on a major cliffhanger; essentially it’s only the first half of a two-volume story. So I strongly recommend that readers have the next book in the series ready to start as soon as you are finished with this one. I ran down to the library immediately after finishing this to pick up the next book, Thursdays with the Crown, which is a wonderful, fantastical adventure that may be my favorite book in this series yet. Ah, so fun -- a huge flame-colored egg! Dragon egg? Roc egg? Oooh! It's a griffin! And the castle is hiding it! Hmmm. The castle is doing some very odd shifting here. Rooms appear and move around, doors get blocked off, and it's all getting bigger and more dangerous. I wonder why? Sweet: Celie gets to ride around on the griffin! I gave Tuesdays at the Castle to my nieces, as I enjoyed the bright, resilient young heroine, and her quirky, benevolent old castle. Seeing Wednesday in the Tower, I bought it without hesitation, and read it myself as a light treat--and am so disappointed that I will actually return it! I cannot give this story to my nieces, as it is so poorly written. The storyline is an odd combination of breeziness ( in details and descriptions never explored) and complexity ( George seems to be trying to qui I gave Tuesdays at the Castle to my nieces, as I enjoyed the bright, resilient young heroine, and her quirky, benevolent old castle. Seeing Wednesday in the Tower, I bought it without hesitation, and read it myself as a light treat--and am so disappointed that I will actually return it! I cannot give this story to my nieces, as it is so poorly written. The storyline is an odd combination of breeziness ( in details and descriptions never explored) and complexity ( George seems to be trying to quickly build a history for the castle, and introduce new creatures, worlds, and aliens.). Meanwhile, the characters remain sketches, only hinting at possible depth, and the villain is instantly recognized by protagonist and reader alike. There are two main reasons that I cannot pass this book on. The first is that the plot is forced, with participants jumping to illogical conclusions, leading to inadvisable actions. This lack of thought and reactionary, black-and-white thinking is not something that I want to pass on to my nieces. The other is that this book ends not with resolution of the conflicts that it introduces, but with an abrupt cliffhanger which introduces yet more distress, and more questions. The implication here seems to be that the author was rushed into creating something to publish, and to submit it with no thoughtful editing, while forcing the series into a serialized, read-the-next-installment-to-find-out-what-happens form which traps the reader into installment payments. What promised to be a fresh and charming approach to the Princess-story form has devolved into a cash cow, milked before it was ready, yielding only a thin stream of non-nutritive skim milk. I really liked Tuesdays at the Castle, and I think this one is even better, mainly because the nature of Castle Glower is at the heart of the story. It's no longer just an eccentric, interesting aspect of the kingdom; Celie's adoption of a baby griffin calls into question a lot of things everyone has always assumed about the Castle, particularly the issue of where the rooms actually come from. Celie is a really fun protagonist, and I love her interactions with Rufus the griffin. I also like Bran I really liked Tuesdays at the Castle, and I think this one is even better, mainly because the nature of Castle Glower is at the heart of the story. It's no longer just an eccentric, interesting aspect of the kingdom; Celie's adoption of a baby griffin calls into question a lot of things everyone has always assumed about the Castle, particularly the issue of where the rooms actually come from. Celie is a really fun protagonist, and I love her interactions with Rufus the griffin. I also like Bran, valiantly doing his best to be Royal Wizard despite his youth, and Pogue Parry, who is my favorite character and is developing in interesting ways. The sequel to, Tuesdays at the Castle, does more world building than the first novel explaining the history of the castle and how it got its powers. It is more of a setup for the third book with its cliffhanger ending, but I enjoyed the mythical creatures, pacing, and heroine. Celie is back with her kind ways and important skills of mapping the castle and communicating with it. When she finds a mysterious egg in a new tower, she watches it everyday until it hatches a creature that imprints on he The sequel to, Tuesdays at the Castle, does more world building than the first novel explaining the history of the castle and how it got its powers. It is more of a setup for the third book with its cliffhanger ending, but I enjoyed the mythical creatures, pacing, and heroine. Celie is back with her kind ways and important skills of mapping the castle and communicating with it. When she finds a mysterious egg in a new tower, she watches it everyday until it hatches a creature that imprints on her. The castle wants her pet kept secret and Celie must learn how to be responsible for raising it without the help of her parents. When a creepy wizard comes to the castle to help her brother, Bran, decipher a storehouse of magical and powerful weapons, the castle starts to change in alarming ways forcing everyone to work together to try and make things right. The family decides to trust the wizard, but Celie and Pogue think he is up to something. When things reach a crisis it is up to Celie to make the right decision and save her family. While the plot's pacing sputters a bit at the beginning, most of the threads from subplots come together and make for a fast-paced ending. I enjoyed the world building and explanation of the castle's powers. I think this is the strength of this book for it gives a better foundation for the characters. I would have liked more development of a diverse culture in the alternate world, but it suggests this won't happen until the next book. The villain or not - it isn't clear - is somewhat one-dimensional and I would have liked to know more about why he was so obstinate in his opinions about what action to take. The cliffhanger suggests it is to come. On the one hand, I liked the superpower explanation, but on the other I want more regarding the alternate world and its culture. Bring on book 3! the book is just over. I took a brief look at other people's reviews just to be sure it wasn't a fault in the review copy. I don't much care whether a book is long or short, but I do expect an individual volume to reach some sort of conclusion. This is not #2 in a series. It doesn't even have the completeness one expects from the short stories many authors produce as "X.5", a little scene between books. This is just the first portion of the next book. I hate that. I hate it enough that I can feel my rating drop the longer I take to write this. I liked this book although not as much as I liked the previous one in the series – Tuesdays at the Castle. Here, the tale of Princess Celie and her family continues. They live in a Castle with a personality, a magical Castle which occasionally adds rooms, removes hallways, installs new towers and reroutes corridors without consulting or even informing its human denizens. This time, the Castle is on a mission of profound change, and Celie, the Castle’s most beloved member of the royal family, is I liked this book although not as much as I liked the previous one in the series – Tuesdays at the Castle. Here, the tale of Princess Celie and her family continues. They live in a Castle with a personality, a magical Castle which occasionally adds rooms, removes hallways, installs new towers and reroutes corridors without consulting or even informing its human denizens. This time, the Castle is on a mission of profound change, and Celie, the Castle’s most beloved member of the royal family, is once again the heroine. She finds a griffin’s egg in one of the newest towers. In fact, the tower is so new nobody could see it but Celie. Obviously, the Castle is protective of its little griffin and it wants Celie to hatch and raise it… without telling anyone, especially not her parents or a visiting wizard. A brooding, slightly sinister personage, that wizard, and Celie doesn’t like him from the beginning. So the griffin becomes their secret – Celie’s and the Castle’s. Keeping such a secret is not very hard to do: nobody believes in griffins anyway. They are a myth, right? That griffins are depicted on the kingdom’s coat of arms doesn’t mean a fig. Nobody has ever seen them in nature. Of course, as soon as it hatches, Celie does, the first person in several hundred years, and she instantly falls in love with her little (not really) protégé. The story starts slowly. In fact, despite the griffin escapade, I was getting bored and wanted to abandon the book until about 40% in. I started and stopped, then continued and stopped again. But I remembered the delight of the first book in the series and kept on reading. I was rewarded for my persistence. The tempo picked up eventually, and I read the rest of this short novel in one sitting. As with the previous book, the author’s characters are alive and diverse, but she lavishes most of her attention on Celie – a charming protagonist, courageous, compassionate and very smart, despite being the youngest. Her family cherishes her. The griffin considers her his mother. And the readers adore her. The book would’ve been better if it didn’t end in a cliffhanger. It feels like I only read the first half of the story, and then it was arbitrary cut off at the point where the real adventure starts. Maybe that’s why it was so slow to start, because the entire book is just the first act, setting the stage for what will happen next. Now, I must read the next book. I love that I have gotten to the point that my eight year old daughter is handing me books and saying, "Mom, you have to read this!" I handed her Tuesdays at the Castle last year, and she has breezed through the series. She has been insisting that I needed to read the other books as well, and took things into her own hands last week by forcibly handing me this book. I was reminded of why I love Jessica Day George's books in the first place. Castle Glower is magical, mysterious, and capricious. I I love that I have gotten to the point that my eight year old daughter is handing me books and saying, "Mom, you have to read this!" I handed her Tuesdays at the Castle last year, and she has breezed through the series. She has been insisting that I needed to read the other books as well, and took things into her own hands last week by forcibly handing me this book. I was reminded of why I love Jessica Day George's books in the first place. Castle Glower is magical, mysterious, and capricious. I wanted to unravel all of its secrets. Celie was a great heroine, who is courageous, kind, and not afraid to ask others for help. Wednesdays in the Tower was a perfect blend of magic and adventure. I loved imagining myself flying along with Celie (although, I would be flying a dragon). This story brought all of my childhood imaginings back to life, if only for a few hours. Oh wow! Do I ever love this series! All I can say it is a younger person's Harry Potter, or HP lite. I cannot wait to start the next book in the series! I got a copy of this book to review through NetGalley(dot)com. Thanks to Bloomsbury and NetGalley for giving me the chance to review this book. Last year I read Tuesdays at the Castle and really enjoyed it. This sequel to that book was a fun read but not as magical as the first book. Things start going strange in Castle Glower. First Celie finds a strange orange egg in a tower that’s never been there before and she needs to figure out what it is. Bran, the new Royal Wizard, is in on the secret bu I got a copy of this book to review through NetGalley(dot)com. Thanks to Bloomsbury and NetGalley for giving me the chance to review this book. Last year I read Tuesdays at the Castle and really enjoyed it. This sequel to that book was a fun read but not as magical as the first book. Things start going strange in Castle Glower. First Celie finds a strange orange egg in a tower that’s never been there before and she needs to figure out what it is. Bran, the new Royal Wizard, is in on the secret but is swamped with identifying a bunch of magical armor and weapons that showed up in a new armor room. Meanwhile a visiting wizard stops by to help Bran and he seems to have a hidden agenda all of his own. Adding to all of this is the Castle’s increasingly erratic temperament; rooms no one has ever seen before are appearing left and right. This was a fun continuation of the Castle Glower series. Not as magical and whimsical as the first book in the series, but still a fun read. The biggest downfall to this book is that it ends on a horrible cliffhanger and reads more like half of a book than a full book; I felt like half of the story was missing. Celie and her siblings are fun to read about. They are all very agreeable characters and they work together well. It is always fun to see how well Celie’s family gets along together and how well they work together to solve problems. It makes for a light and uplifting read. I enjoyed that the storyline is expanding here, we finally get some explanation as to why Castle Glower is how it is. We also learn a lot of history behind the castle itself. The additon of some mystical creatures made the story even more fun. I did feel like the story was missing some of the whimsy, surprise, and delightful magical feel of the first book though. Part of that is just because we’ve already been introduced to this castle and nothing is as surprising this time around. I also felt like maybe Celie and family were just dealing with too many different problems at once, so the story was a bit bogged down and not as light-hearted and magical as the first book. The absolultey biggest drawback to this book for me was the horrible cliffhangers. Oh, Miss Jessica why did you have to do that? I hate cliffhanger endings, it really drops my opinion of the book a lot. I hate it when author’s depend on a cliffhanger to force readers into continuing a series rather than just providing a good story and world that makes readers want to come back for more because the author writes well. Castle Glower, the royal residence of Sleyne, is a sentient, living entity that makes its wishes known in no uncertain terms and selects and protects the royal family. The Castle is up to its usual tricks, adding and removing rooms and features on Tuesdays. One morning Princess Celie, who knows Castle Glower better than anyone, is on her way to the schoolroom when the Castle suddenly adds a staircase leading up to a new, roofless tower. The curious young princess climbs stairs where she finds a Castle Glower, the royal residence of Sleyne, is a sentient, living entity that makes its wishes known in no uncertain terms and selects and protects the royal family. The Castle is up to its usual tricks, adding and removing rooms and features on Tuesdays. One morning Princess Celie, who knows Castle Glower better than anyone, is on her way to the schoolroom when the Castle suddenly adds a staircase leading up to a new, roofless tower. The curious young princess climbs stairs where she finds a large nest with an enormous, flame orange egg in the middle. She runs down to tell her family, but returns to find the staircase has disappeared. Castle Glower will allow no one else to see the stairs or the tower, but Celie is drawn repeatedly back to the tower where she wonders about and watches the egg. She is shocked and thrilled when it hatches to reveal a baby griffin. Celie can hardly wait to show her family, but the Castle makes it plain that she is to keep it secret. Then the Castle routine begins to alter, with changes coming more and more frequently, changes that are often dangerous and always puzzling. A strange wizard arrives to help Royal Wizard Bran determine what is happening to Castle Glower and why. These factors come together to provide clues to the Castle's mysterious past, but no one seems to know how to stabilize the Castle, and Celie and her family fear that the Castle is being attacked in the other world where it originated and where much of it still remains. How can a young girl raise what she always thought was a mythical creature without making others suspicious? Is the griffin's appearance related to the disturbance in Castle Glower? And most importantly, how can they help the Castle? This felt like the reading equivalent of watching a clip show when it’s only the second episode of the show you’ve ever watched. There’s a ton of half-done worldbuilding — aliens! wizards! griffin riders! other worlds! — spliced together with Celie running around the castle and raising a pet griffin. I might’ve been into this as a kid, but, well, I’m not a kid anymore. I kept reading a chapter of this, wandering off, and remember three days later that I still had the rest of the book to read. Al This felt like the reading equivalent of watching a clip show when it’s only the second episode of the show you’ve ever watched. There’s a ton of half-done worldbuilding — aliens! wizards! griffin riders! other worlds! — spliced together with Celie running around the castle and raising a pet griffin. I might’ve been into this as a kid, but, well, I’m not a kid anymore. I kept reading a chapter of this, wandering off, and remember three days later that I still had the rest of the book to read. Also, this isn’t a complete book. It exists merely to set up book three, and the ending is a giant cliffhanger. (It’s two of my favorite small screen storytelling devices in one middle grade book!) And I tell you what: even at the age this book is written for, that would’ve pissed me off. You know that wonderful moment when you really like a book and think it’s a standalone but then find out a sequel was written? I totally recently had that moment with Tuesdays At The Castle by Jessica Day George. I had to read it a few years ago for the CYBILS awards and find myself utterly charmed by what I had read, and so it was a total delight to find out we would be returning to Glower Castle in Wednesdays In The Tower, the sequel. For the most part, I really enjoyed revisiting Celie and di You know that wonderful moment when you really like a book and think it’s a standalone but then find out a sequel was written? I totally recently had that moment with Tuesdays At The Castle by Jessica Day George. I had to read it a few years ago for the CYBILS awards and find myself utterly charmed by what I had read, and so it was a total delight to find out we would be returning to Glower Castle in Wednesdays In The Tower, the sequel. For the most part, I really enjoyed revisiting Celie and discovering new quirks of the castle, but I honestly think that Tuesdays At The Castle is a better read, however, I still feel optimistic about book three. Another fantastic story and a promise of at least one more book with Castle Glower! I love Jessica Day George's writing style and characters, it makes me happy every time I pick up one of her books. While clearly aimed at early and middle grade readers, this series is Just interesting enough to keep me reading. My 9 year old son also enjoys it. In "Wednesdays," Celie finds herself irresistibly guided to a new tower room in the castle occupied only by a hot, orange, pumpkin sized egg. When it hatches days later, she finds herself the parent of an extremely needy baby griffin - an animal heretofore considered mythical, despite its presence on the royal crest. (We're not, apparently, to count While clearly aimed at early and middle grade readers, this series is Just interesting enough to keep me reading. My 9 year old son also enjoys it. This book was fun to listen to. The story was cute and entertaining. The castle being somewhat alive and changing constantly changing is cool and the Griffin is a neat creature that you don't see in books very often. Celie is a cute main character, adventurous and smart. I like the way she interacts with her siblings, especially her brothers. It's nice seeing them get along and support each other. This one had a cliffhanger so now I'll be checking out the third book! George's books give me so much joy. Her characters are kind, loving, and ambitious and encourage me to be so too. I loved Tuesdays, and this one inspired me to order the rest of the series on the spot! The plot kept escalating, a skillful accomplishment for a writer. The characters could use more depth (although I liked the character development of Pogue, whom I like much better now compared to in Tuesdays), and I would like more of the king and queen, but I just want to stay in the world George George's books give me so much joy. Her characters are kind, loving, and ambitious and encourage me to be so too. Really enjoyed this but can't believe the cliffhanger ending! Sweet series for the young reader. Leaves you with a cliff hanger! Argh!! Wait! You can’t just end a book like that?! Gah! And I had to place a hold on the next one at the library. I don’t want to wait three weeks! Gah! This review has been hidden because it contains spoilers. To view it, click here. I read the first book in this series, Tuesdays at the Castle, because I had been impressed by the author's "Dragon Slippers" trilogy and the premise seemed intriguing. While I found the first book to be simply "okay," I did enjoy the premise of a magic castle that not only adds new rooms and takes away old on a regular basis, but is semi sentient and does its best to help its inhabitants. The ending seemed a bit "deus ex machina" to me and the plot dragged at points, but it was charming enough t I read the first book in this series, Tuesdays at the Castle, because I had been impressed by the author's "Dragon Slippers" trilogy and the premise seemed intriguing. While I found the first book to be simply "okay," I did enjoy the premise of a magic castle that not only adds new rooms and takes away old on a regular basis, but is semi sentient and does its best to help its inhabitants. The ending seemed a bit "deus ex machina" to me and the plot dragged at points, but it was charming enough that when I learned there was a sequel, I went ahead and picked it up for a read. "Wednesdays in the Tower" is a step up from its predecessor in that it doesn't drag and keeps a fairly steady pace throughout, and adds some back story and mythology to the kingdom and the castle. But, it suffers from a case of deus ex machina, though not as badly as its predecessor, and while it answers some questions, it ends without much resolution. Princess Celia, self appointed cartographer of the ever shifting Castle Glower, knows that the castle makes most of its changes on Tuesdays. So when a mysterious tower that only she can access shows up on a Wednesday. A tower containing a rather large egg. She can't help but wonder what's going on. The castle seems insistent that she care for the egg, as well as the resulting griffin chick, and keep the hatching a secret from the rest of the castle's inhabitants. As time goes by the griffin, Rufus, grows larger and harder to conceal, and the castle's actions become more erratic and disturbing. When a mysterious wizard with his own private agenda comes to investigate what's wrong with the castle, Celia and her brother Bran realize that the castle has been providing clues to its own origins all along. And Rufus the griffin somehow ties into that origin. Like its predecessor, this book is a cute and lighthearted read, with a feisty and capable heroine, an griffin, and a castle that's almost as much a character as the rest of the cast. And unlike its predecessor, this book maintains a steady pace throughout and doesn't get itself lost in unnecessary details. It does drop in plot developments without foreshadowing, however, as if the author didn't plan the story thoroughly ahead of time and made up things as she went along. And some of the characters remain rather flat and one dimensional, though more effort has been made to develop some of them. I read TUESDAYS IN THE CASTLE aloud with Lilah and we both loved it. That book introduces Castle Glower, which is almost as much a character as the people who reside in it, chief among them Princess Celie, her siblings Bran, Rolf, and Lilah, and their parents. Castle Glower constantly changes itself, adding and removing rooms, for reasons that are not understood at the beginning of the book. We were delighted to have the opportunity to review the follow-up, WEDNESDAYS IN THE TOWER. In the sequel, George engages in more world-building than in the first book. We learn more about the castle, having already experienced its quirks, and its history is revealed. A tower appears to Celie one day, with a strange egg inside. Celie tries to show her siblings, but the castle only allows Celie in. And then the egg hatches. It becomes clear that the castle wants Celie to care for and raise what’s inside. First and foremost - what was up with that ending! Freaking cliffhanger thing! Ugh! I enjoyed this story. It's a quick, light read and, unlike it's predecessor which I had said was a bit darker than I expected, this one was more on the light side all around. Even the villain seemed a more hindrance than a real threat (though we'll see what comes in the next book). There wasn't much in the way of character growth, I don't think, except for on the part of Lilah, which was kinda cool to see. I also e First and foremost - what was up with that ending! Freaking cliffhanger thing! Ugh! There wasn't much in the way of character growth, I don't think, except for on the part of Lilah, which was kinda cool to see. I also enjoyed the bits with Lulath. But this story is mostly about Celie and the griffin, and trying to find out secrets about the Castle, as it starts acting all out of sorts, and they want to find out what's wrong. It was a fun story, and I'm definitely curious about the nuggets of history we learned, and where it will lead Celie and Co.
Another wonderful book in this series! I loved the first book so much, and wondered what direction the author would take next, and I was astounded with the magical scope of the story! Castle Glower holds so many secrets and magical enigmas, and I can't wait to read the rest of the books. In this book, Celie finds a mysterious orange egg that the Castle will let only her see. She hatches the egg, and cares for the newborn creature without letting anyone in the castle know about it. But her brother Another wonderful book in this series! I loved the first book so much, and wondered what direction the author would take next, and I was astounded with the magical scope of the story! Castle Glower holds so many secrets and magical enigmas, and I can't wait to read the rest of the books. In this book, Celie finds a mysterious orange egg that the Castle will let only her see. She hatches the egg, and cares for the newborn creature without letting anyone in the castle know about it. But her brother Bran, the Royal Wizard, finds Celie with her quickly-growing and mischievous pet, and the two have to find a way to protect the magical baby, and somehow protect the Castle from threats as well. Adventure, and spying, and mysterious secret rooms, labyrinths, and passageways are all in abundance, but the best part of this particular story is the rich history of the Castle and how that history of magical artifacts, maps, and symbols comes into play with the plotting and scheming. Celie is spunky and fun and intelligent. I love how all the people in the Castle really respect her judgement although she's young, and even the maids will ask her advice, and the lords of the court accept her guidance. Jessica Day George likes chocolate, knitting, books, travel, movies, dragons, horses, dogs, and her family. These are all things to keep in mind if you ever meet her. For instance, you could bring her chocolate to make the meeting go more smoothly. You could also talk about how adorable her children are, even if you have never seen them. You could discuss dog breeds (she had a Maltese named Pippin Jessica Day George likes chocolate, knitting, books, travel, movies, dragons, horses, dogs, and her family. These are all things to keep in mind if you ever meet her. For instance, you could bring her chocolate to make the meeting go more smoothly. You could also talk about how adorable her children are, even if you have never seen them. You could discuss dog breeds (she had a Maltese named Pippin, and grew up with a poodle mix and a Brittany Spaniel. Right now she has a Coton de Tulear named Sunny). You could talk about Norway, and how it's the Greatest Place On Earth, and Germany, The Second Greatest Place On Earth. You could ask her about yarn, and indicate a willingness to learn to knit your own socks, if you can't already do so.